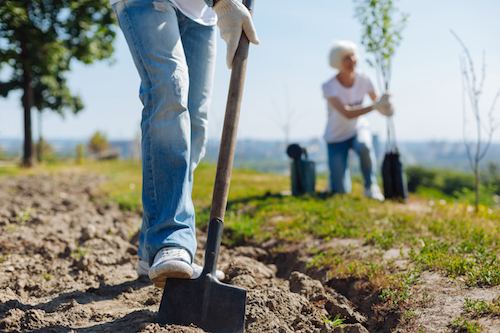 How to Prepare Your Land Before Planting a Tree | Mr. Tree, Inc. Proper land preparation is an essential step that should not be overlooked. Land preparation becomes the foundation for the best, fast-growing trees and is an extremely important step before planting. Site preparation is about treating the land to help improve tree planting conditions. It would be a shame to put so much effort into planting a tree only for it to live a short life. Preparing your land can be the biggest difference between a healthy and unhealthy tree. Proper land preparation, even before a tree is planted, include site assessment, soil improvement, digging the proper hole, creating space for root development, and prepping the vegetation. Site preparation also varies based on the site’s needs, so don’t hesitate to reach out to a professional for help. Preparing the site correctly will transform your land to a healthy and beautiful foundation for your trees. Urban areas don’t offer the best soil to plant trees as the soil may be too compacted from construction and/or carry fewer nutrients compared to a forest’s soil. Compacted soil is soil pushed down from pressure. Roots of a tree can’t penetrate compacted soil because of the lack of oxygen, especially if the soil is made up of a mixture of different soil types. Compacted soil may stunt the tree’s health and growth. This doesn’t mean you can’t plant in highly compacted areas. This only means that you will need to loosen the soil before planting. Improving soil texture and structure, especially in areas deprived of nutrients, is essential for the health of a tree. The best soil amendment is adding organic matter or compost. Organic matter releases nutrients that become absorbed by soil-dwelling microorganisms. Organic matter consists of well-rotted manure and soil conditioners and is a preferred soil amendment for the best trees. You can also use wood chips or sawdust, but these may take away nutrients from the soil, so consult with an arborist first. A bed of amendments should happen before the tree goes into the ground. An amendment that breaks down slowly is best for long-term growth. Shredded bark holds the structure well as it takes several years to decompose. Compost breaks down within a few months, but it’s strengthened with nutrients from the abundance of microorganisms. Make sure you do the job without damaging plant roots. If needed, you can spread the amendment over the soil like a mulch as the microorganisms will carry the nutrients over time. The planting hole should be at least one and a half times the size of the root hole. The sides of the planting hole should be loosened. If a crane digger or other machinery is used, the sides will be smooth and sealed preventing root penetration. The soil needs to be dug over at least 15 centimeters above the highest groundwater level. This allows for a capillary rise of groundwater and promotes deep root development. An extra tip is to look for the flare of the trunk at the soil level. The flare should not be covered by the soil. Plant the tree slightly high, especially in new soil to avoid the plants from dying of over-watering. You can check to see if your hole is at the right depth by taking your shovel and laying it across the hole. The top of the tree flare should be at the handle level. Take into account that the final space for root development will be much larger, about two to three times than the root ball. The larger the tree, the more topsoil and tree soil will be needed for root development. Be sure to factor in the living space of the tree. The older the tree, the more space it will need for root development. Keep in mind that a larger tree with more space will also require more maintenance, so plan accordingly. It is better to fill the hole with more organic matter or compost than it is to have a hole too small for the root ball. Control competing vegetation before tree planting. Vegetation control will vary in density and height. If the vegetation is light, then you can just have decent control in a narrow row along the tree rows. If the planting site has taller vegetation, control the vegetation across the whole site. This will reduce the losses from disease and mice. And if the vegetation is moderate to heavy, prepare with weed control for a while. You can always have your local professional come by regularly for vegetation maintenance. Check to see if the site has a lot of willow, alder, prickly, and ash as these shrubs will compete with the tree seedlings. If there seems to be a lot of these brush varieties, consider removal before planting your tree. You can use a combination of mechanical maintenance and herbicides to control your vegetation. This will give you the best, fast-growing trees you could hope for. You want to avoid using a bulldozer to remove vegetation because this method removes topsoil which damages the land and increases the chances of erosion. Prepare your land before planting and growing trees to promote a healthy foundation for your tree’s growth. Fall is the best time to plant a tree because it gives the tree a chance to establish itself on the site by the spring and summer heat. You want the trees to have enough time to establish roots to help stay strong during high and low heat temperatures. Proper preparation will pay off in the long run. Be sure to have a local professional maintain your area to build a solid foundation for your tree to grow on. From vegetation control to soil amendments, your local professionals are here to help. Proper land preparation is essential to a tree’s life, so make sure to cover this step thoroughly.